Retirees may be the best-known recreational vehicle (RV) enthusiasts, but the RV traveler is getting younger—from an average age of 67 a few years ago to less than 50 now—the average age of today’s typical RV owner is just 49. According to a University of Michigan study, baby boomers own the most recreational vehicles. Another study showed that one in five people (surveyed) have expressed interest in buying an RV within the next five years. The strongest interest is among younger age groups with 30 percent of those age 18-34 and 16 percent in the 35-54 age group. RV sales, leases and rentals are at an all-time high and growing at 30 percent annually. This growing market has not gone unnoticed by golf courses across the country and in particular, the Northwest. Many courses are scrambling to incorporate RV camping into their facilities. Mirroring the surge in RV ownership is the growth in RV clubs. These groups like to travel together and have the potential to fill a golf course or at least fill the campsites, and they tend to stay for a few days and play more than one round of golf. This is certainly good news to golf courses who have already made the investment in RV accommodations. Many golf courses around the Pacific Northwest have either upgraded their RV lots or added spaces for recreational vehicles. And these are not just any ordinary spots. These are full hookups with cable television, wireless connections for laptops and more. 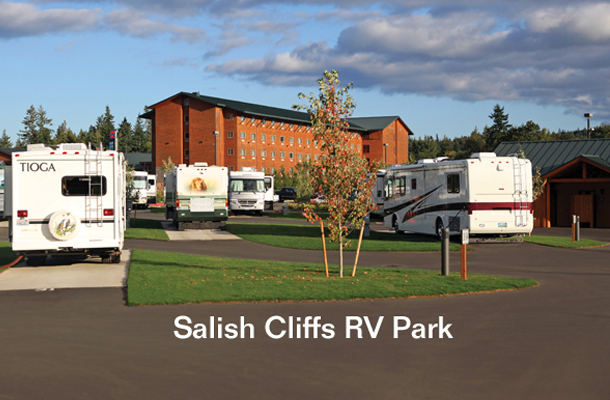 These days, RV parks are becoming even more user-friendly, with cable or satellite television hookups, shower and laundry facilities, restaurants and more – Mallard Creek in Lebanon, Ore. has a real upscale landscaped park adjacent to the golf course and restaurant. Horn Rapids RV Resort in Richland, Wash., is across the highway from the golf course and is a five-star park with activities like shuffleboard, horseshoes, and volleyball. They also provide a large swimming pool and hot tub spa. From the coast to the inland deserts and mountains golf courses around the Northwest are being discovered by RV travelers. Some courses have also made it more affordable by extending special rates to campers. There are plenty stay-and-play packages available, and if you have the time, many will offer weekly, monthly, seasonal and even yearly rates. One of the benefits of traveling to distant golf courses in the Northwest is the opportunity to stop at the many attractions along the route or just enjoying the terrific scenery that we are so fortunate to have. It’s easy for RV travelers who are on an extended drive to incorporate several courses in their trip. Fuel prices don’t seem to be a deterrent for RV travelers. A recent survey of over 400 RV owners, taken as gasoline prices were climbing rapidly in 2005, showed that seven out of 10 RV owners surveyed plan to use their RVs more this spring/summer than they did a year ago despite higher fuel prices. Fuel prices may be up this year, but look for plenty of RVs to be on the roads this summer. With plenty to see and do around the Northwest, RVs will be around –and at the golf courses, too. Over a quarter (27%) are planning to use their RVs the same amount as last year. Only about four percent plan to use their RVs less this season, which will make for a busy time on the roads during the summer of 2013. There are many reasons people take up RV traveling – the freedom to move from place to place at will, the ability to take more stuff with you on trips, the togetherness with the family or because it’s generally cheaper than hotels and restaurants. Breaking into the RV life-style doesn’t have to be expensive as there are several good older vehicles on the market that allow first-time buyers a chance to limit their investment. Whatever the reasoning, once you own an RV it can easily become the main mode of transportation for nearly all of your vacation travels. just a few minutes south of Moses Lake.